Adopting An Easter Bunny? Make Mine Chocolate! Easter bunny, anyone? 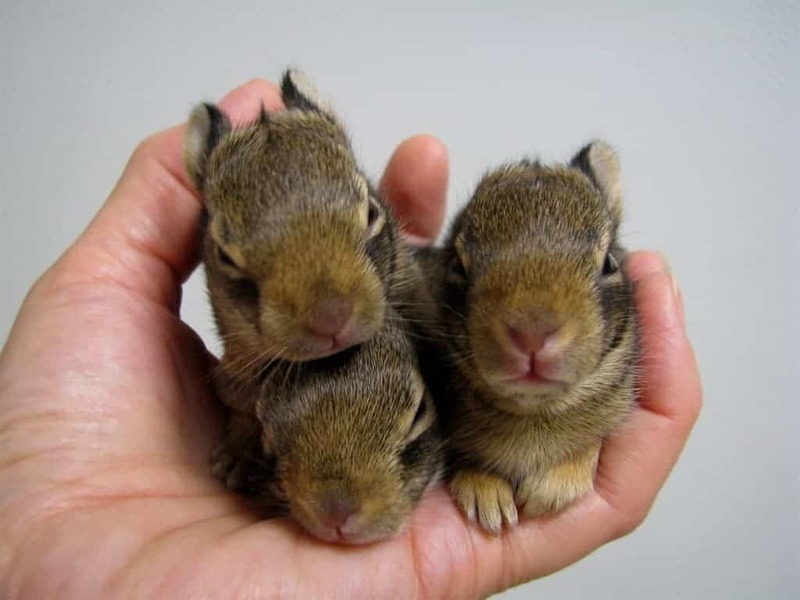 Awwww…nothing sweeter than baby bunnies. Well, baby anything, right? And soon, our “Cottontail Mountain” home will be surrounded with rabbits courting and chasing and pitching woo–with lots of offspring soon to appear. Karma-Kat loves watching “bunny TV” out the back patio windows. I think he’d love to have one come inside to *ahem* cuddle and play. NOT! Just like other animal companions, it takes more than admiration to make bunny love positive for everyone. Easter is not the time for a spur of the moment furry gift. Chicks and ducklings and baby bunnies by the score are purchased each year, some dyed in ridiculous colors, almost as gag gifts despite the fact they are living creatures with very specific care needs. A rabbit is more than an Easter bunny joke. The House Rabbit Society has lots of great information about caring for a bunny. They do make wonderful pets–but you have to want them for more than a couple of weeks, or until the “cute” wears off. Did you know that bunnies mark territory? Chew all kinds of stuff? (even more than dogs!). And unless you “fix” your bunny friend, aggression can become a problem. Read on! Bunnies are intelligent, social animals who need affection and get along well with cats and well-behaved dogs. They can be litter box trained (emphasis on the trained)–it doesn’t happen with the wave of a wand. Rabbits tend to eat and poop at the same time–the original multitasking pet–so standard clay cat litters won’t work and can be dangerous to bunnies. You’ll find tips on rabbit care and training at the House Rabbit Society, a nonprofit group dedicated to helping educate the public. Similarly to cats and dogs, intact rabbits use bodily functions to mark territory. You’ll need to spay or neuter your bunny friend to curtail the hormones that prompt marking behavior. This also decreases destructive chewing and territorial aggression. An attack rabbit is no laughing matter! House rabbits should be “fixed” between the ages of 3-1/2 to six months, depending on sexual maturity, by an experienced rabbit veterinarian. Once de-sexed and litter box trained, bunnies can freely roam your home and interact with the whole family. But first, rabbit proof the house. It’s natural for rabbits to chew on just about anything: furniture, rugs, drapes, and even deadly electrical cords. Use the same tips for preventing canine teething to safeguard rabbits and provide safe chewable alternatives and toys to keep the bunny happy and distracted. Rabbit experts recommend cut, dried branches from apple, willow or aspen, or pine firewood; cotton towels; baskets or cardboard boxes filled with hay; and compressed alfalfa cubes. Juvenile delinquent bunnies under a year of age are more mischievous, and require more safe confinement and bunny proofing than older rabbits. Your pet bunny requires the same good veterinary care you provide for your cats and dogs, and rabbits are prone to specific health issues you’ll need to address. For instance, bunnies are naturally clean and groom themselves constantly–but that makes them prone to fur balls like Kitty. But rabbits can’t vomit. If the excess fur can’t be passed into the litter box, a blockage can kill the pet. Therefore, you’ll need to regularly groom your rabbit, provide at least 30 hours exercise a week to keep bunny moving on both the outside and inside, and provide fresh vegetables to help keep her regular. Special bunny hairball laxatives can help during molting season. 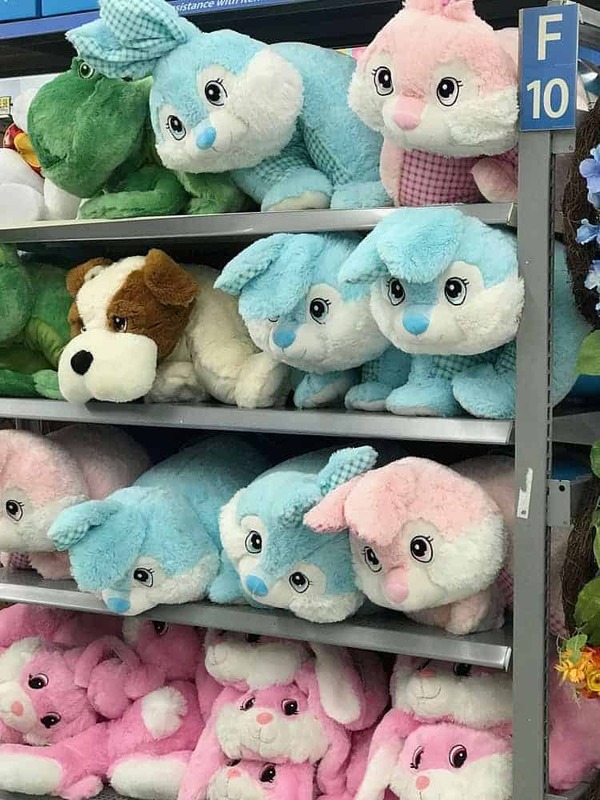 If you don’t have time for a live Easter bunny, there are plenty of “stuffies” to adopt! WHY NOT ADOPT A RESCUE EASTER BUNNY? The days and weeks following Easter finds many adoptable bunnies in shelters. If you really want a furry friend, you could also save a life by rescuing one of these sweet babies. This year prepare ahead of time for your new Easter bunny surprise. You know your situation best. Bunnies can be rewarding pets but they do require time, training, and appropriate care. In the months following Easter, local humane societies and rabbit rescues are flooded with rabbits, former Easter gifts whose owners no longer want them. The unlucky ones are dumped outside where they usually become victims of predators, cars, illness, and injury. Easter is a joyous time of rebirth and hope. Enjoy the egg hunts, the Easter candy, dinners with family and friends, safe plants (BEWARE of Easter lilies! )–and if you’re ready, welcome a living creature into your home and heart. If not ready for the breathing/chewing/pooping version, celebrate the wonderful world of bunnies with a stuffed toy, or a chocolate rabbit. They won’t mind being tossed aside. Do you share your home with a bunny? My brother’s family has a pet rabbit that gets along well with the cats and dog–it can be done! Please share your bunny-licious experiences. I love hearing from you, so please share comments and questions. Do you have an ASK AMY question you’d like answered? Do you have a new kitten and need answers? NOTE: Some links to books or other products may be to affiliates, from which I may earn a small percentage of sales, but I do not recommend anything unless I feel it would benefit readers. Stay up to date on all the latest just subscribe the blog, “like” me on Facebook, and sign up for Pet Peeves newsletter. Stay up to date with the latest book give aways and appearances related to my September Day pet-centric THRILLERS WITH BITE! We used to think that rabbit and our cat hated each other… until after the rabbit died. Cat was HEARTBROKEN. That rabbit used to get in ALL the cat’s favorite spots – back of the couch, under the Christmas tree… drove the cat up the wall. Dog used to chase her back and forth around the house too (the beagle-mutt I have mentioned so many times). Mom refuses to get another bunny since then, for fear she’ll expect them all to have the personality Stinker did (yes, that ended up being her name LOL). Bunnies do have personalities. I don’t know enough about them to do more than speculate on behavior, although I suspect there are some breed differences and socialization influences how well they get along with everyone. Mom had wabbits as a kid, but that was it. We know some people that have a house wabbit but I am not allowed to visit. Mom said the wabbits were great but they did a lot of damage to things in the house with their chewing. Yes, the wabbits must chew or their teeth grow too long. “Nom-nom-nom-nom-nom…” there goes the dining room table! So it’s all about pet-proofing for wascally wabbits! We do share our home with a rabbit, rapidly becoming more mine than anyone else much to the disgust of Beastie Girl, LOL. Last year a rabbit who’d probably been dumped or forgotten followed a kiddo home. Thankfully, we had an extra cage and rabbits do well on a Guinea Pig (which we also have) diet. Kids name him Bugs and, other than needing to trim his nails, he’s now healthy. Unfortunately, Beastie Girl frightens him. Probably due to his being out roaming the neighborhood for over a week before we took him in than the dog herself. We’ve cordoned off the kids’ game room so Bugs has a dog free area. He also gets time out in the back yard each week for exercise. Personality-wise, he’s more like a cat than I’d have expected. He’ll love you up one side and down the other on HIS terms. Yet he likes chasing the boys and having the boys chase him, more dog-like. The Guinea Pigs, he ignores, LOL. They want to cuddle up next to him but he doesn’t want anything to do with THAT. Rubbing him between the eyes will put him to sleep and he seems to like me holding him to do just that. Raelyn, Bugs sounds delightful! I’m very tempted–but must be strong. I’m not sure Seren(kitty) would stand having yet another interloper at her advanced age. Magic would likely love it, though–although all the wild rabbits around drive his nose wild. Our house sits on a hill that used to be called Cottontail Mountain. I grew up with rabbits as a very small child, loved them, didn’t know them that well as my father had them in cages except when supervised out. I remember what a delight it was to have one allowed to play with me in the living room — one of my early Easter memories. Later my dad tried to raise show rabbits. I had thought of adding rabbits to my life again someday but I hadn’t thought of the destructiveness angle, glad you mentioned it. Currently, our dear cat wants to be an only and the most we might add is another cat someday maybe. Rabbits are so sweet. I’ve never had one but always wanted one as a child. Many years ago I had an outside cat that found a nest/den of baby rabbits and brought 3 baby ones one by one to my front door as some sort of prize I guess. They were not alive but after a couple of us looking for hours, we never found where they came from. They were so cute. When I was a child my dad ran the mower over a nest–didn’t hurt the baby bunnies, just uncovered them. We kept Flopsy, Mopsy and Cottontail (real original names, right! LOL!) for about a week before turning them loose after Mom learned they were probably old enough to be on their own. My sisters and I had rabbits when we were kids. I don’t remember what my white rabbit’s name was but I also had a black one named “Thumper” (original, huh?). The white ones were trained to walk on a leash but I never trained Thumper for some reason. They always lived in their cages outside when we weren’t playing with them. As an adult I learned the hard way what an attack rabbit was! At work one day I opened the cage of a beautiful white rabbit and he came at me!! Scared the _______ out of me! Now I know that when a rabbit thumps his foot he means business. I sometimes think about getting a rabbit for an indoor pet but with a house full of former ferals and one rabbit-killing dog that’s pretty much out. Andrea, when we were kids my brother’s white bunny (male) attacked him at the door once, too! My brother had scratches up and down his arms from the rear legs kicking. There’s a reason I call the kitty-play behavior with toys “bunny-kicking into submission” it looks very similar–and effective! I wish I would have known way back when…what I was doing, otherwise I’d probably still have the humongeous bunny. Like I said, it’s a long story. I also wanted to thank you again for your encouraging comments over at Family and Faith Matters. Have a Happy and Blessed Easter. Perhaps, I will do that one day. And thanks for jogging my memory. I’m going to jot the story idea down now, before I forget.